﻿ Hotel Felix, Chicago (IL) | FROM $94 - SAVE ON AGODA! "I was VERY pleased with Hotel Felix :) The hotel staff was v..."
Have a question for Hotel Felix? "The hotel is nicely located in downtown and Whole Foods is in vicinity for good." "The Hotel is very clean and modern and the beds were so comfy!" "Lovely staff especially Deanna on the front reception, very helpful." "Great location near all the action, comfy room and bed, nice..."
For travelers who want to take in the sights and sounds of Chicago (IL), Hotel Felix is the perfect choice. From here, guests can enjoy easy access to all that the lively city has to offer. With its convenient location, the hotel offers easy access to the city's must-see destinations. Hotel Felix also offers many facilities to enrich your stay in Chicago (IL). To name a few of the hotel's facilities, there are free Wi-Fi in all rooms, 24-hour front desk, facilities for disabled guests, express check-in/check-out, luggage storage. Hotel accommodations have been carefully appointed to the highest degree of comfort and convenience. In some of the rooms, guests can find television LCD/plasma screen, linens, mirror, towels, smoke detector. The hotel's recreational facilities, which include fitness center, spa, massage are designed for escape and relaxation. 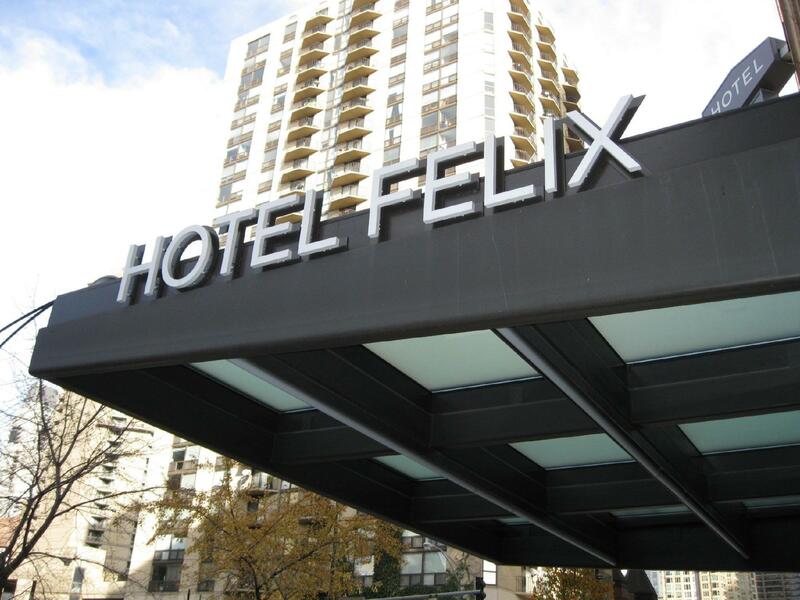 Hotel Felix is your one-stop destination for quality hotel accommodations in Chicago (IL). "Chicago is a beautifull city and Hotel Felix a very good bas..."
Please note a USD 60 security deposit will be charged per night, up to USD 240 total, at the time of arrival. The deposit is fully refundable upon check-out if there is no room or property damages. Valet parking with unlimited access in and out, available at a charge. Please contact hotel directly for further information. When booking more than 5 rooms, different policies and additional supplements may apply and will be informed by the property. Guests are required to show a photo identification and credit card upon check-in. Please note that all Special Requests are subject to availability and additional charges may apply. Our hotel room was a little small and the door was thin where we could hear doors closing as if it was our own. Besides those very small issues we had a great stay. We went with a group for a birthday and the front desk clerk Gabriel made sure our needs were accommodated. He even went above and beyond and provided our birthday boy with a personalized birthday card signed by the staff as well as a drink coupon for the hotel bar. We will definitely be back. Great location near all the action, comfy room and bed, nice shower, good price. Lovely staff especially Deanna on the front reception, very helpful. Made my Chicago stay extra great all round. Recommended.. I was VERY pleased with Hotel Felix :) The hotel staff was very nice and friendly and accommodating to our requests!! The Hotel is very clean and modern and the beds were so comfy! The location was perfect! We were able to walk to see most of the sites on our "must see" list. I highly recommend this hotel....I know when we go back to Chicago, this is a definite where we will stay!! I am not sure what I should expect for 4-star hotel. Compared to my previous hotel without stars, this hotel has no bath tub, nor coffee machine. Room space is smaller but has every necessary things. Air condition can be set in a few range of temperature, but this is understandable because Chicago is normally cold. There was water drop in shower room, so I heard the sound of dropping almost all the time. Other than these, such as staff and location is really nice. In summary, I think for this price (about £60) this hotel is worthy. However, it should be considered that is it worth for 4 stars. Not price worthy, i spent 2 nights prior the big event of chicago marathon, the price went up but they didnt upgrade the room fasilities. There were no kettle in the room, no sleepers, and the bed there are bugs. The hotel is nicely located in downtown and Whole Foods is in vicinity for good. The rooms doesn't have fridge so forget microwave. They don't have free drinking water and a very small water bottle kept inside room costs about $3. But you can buy at cheaper rate at Whole Foods anyway. The front desk staff never cared to at least respond to my smile for number of times I passed by so I felt bad that is it in the culture to not smile back at the guests or what? Room was clean and tidy, bathrooms are not tiny as described in other reviews but they are not too spacious too. There is no closet just couple of hangers below safe. Bed was fine. They have luggage storage service which is good but again Bellman never smile back at you. Did not get chance to have complimentary coffee at their restaurant. As someone that has previously managed for a million dollar company, I understand company policies but I also understand customer service. Managers that don’t provide quality customer service and care give your company a terrible image. My company has spent a lot of money with your hotel in the past, and unfortunately after this experience, through the booking company and your manager Sarah, our company will no longer be booking with your hotels (sister hotels included). Tol small room and everything geti old. All in all, I was pleasantly surprised. Room was small but quite well-appointed. Main source of complaint was the shower: constantly having to adjust the temperature lever - you either boiled or froze to death. I would certainly consider staying there again. The rooms are tiny and old, and extremely noisy (loud heating and very thin walls). The location is great but sadly that’s about the only positive thing. Bien situé, beau quartier et superbe chambre! The only bad thing that I could think of is that you guys don’t have a pool.